While the current Somali transitional government is by no means perfect, there are at least a couple of things it has been doing right: putting in place various apparatuses to pave the way for good governance, and laying the foundation to reestablish law and order. Granted, these two developments are moving at a snail's-pace. Furthermore, these kinds of developments are not as captivating as instances of lawlessness, corruption, violence and piracy, thus they seldom get reported. When it comes to news, especially as it pertains to other non-ally countries, there seems to be a prevalent norm that gravitates toward the negative. Because of this, one is likely to have a blurred picture of the reality on the ground. Some policy advocates are so credulously misinformed, they declare Somalia a hopeless case. The United States and international community tend toward disengaging and leaving the country to its own diabolical vices. One of the main factors that caused the failure of the so-called global War on Terrorism was the fact that it ignored how the feeling of hopelessness inspires desperate and destructive acts. As an individual grows more dangerous when consumed by a sense of hopelessness, so do groups and nations. This is not to downplay the enormity of the task required to help the transitional government restore law and order, but to point out that abandoning Somalia at this critical juncture could simply worsen the situation. While U.S. foreign policy of the previous administration and the role of the African Union Mission to Somalia (AMISOM) have further radicalized more Somalis, disengagement could be a recipe for disaster, not only for Somalia, but for the region and perhaps beyond. In its attempt to develop a comprehensive policy toward Somalia, were the United States to adopt the "constructive disengagement" approach being pushed by the Council on Foreign Relations, it would mean abandonment of two elements critical to its national interest and security: repairing the deeply damaged image of the United States in the Islamic world, and protecting America's geopolitical interests. AMISOM earned a bad reputation during the two-year Ethiopian occupation of Somalia. To improve its image and regain credibility, certain Muslim countries must be persuaded to send their troops. Given the right political and economic support, the transitional government would step up to the challenge and assert its mandate to govern and set the stage for broad-based reconciliation that includes the autonomous regions of Somalia that denounce violence, Somaliland and Puntland. The current transitional government has the potential to surprise the cynics who are writing it off. Contrary to the common practice of the previous transitional governments, the current government is a coalition of Islamists and secularists. The inner circle of influence counseling President Sharif Sheikh Ahmed and Prime Minister Omar Abdirashid Sharmarke on various critical issues are diverse in terms of clan affiliation, educational background, and age and experience, not to mention that a good number of them come from the Somali Diaspora. So it is fair to say that for the first time something that resembles the genuine principle of inclusivity in political participation is shaping itself in Somalia. The biggest hurdle hindering the sustainability of any immediate solution still remains the "4.5 system" in which the zero-sum clan-based competition for resources is institutionalized. Power, according to this system, is divided on an unbalanced scale that guarantees equal distribution to four major clans and a one-half share for minority communities considered to be the riffraff of a clan-based society where might is rewarded. The good news is, elements that could potentially dismantle this unjust system are on the move. Already, within the Somali Diaspora communities, various groups have started holding early political town-hall meetings to develop their platform and form political parties that would run in the upcoming general elections a little over a year from now. And it is this latter development that is further boosting the hope of many active members of the Somali Diaspora who have been yearning for stability and peace. Meanwhile, the alarm bells are ringing. Pirates continue seizing commercial ships and vessels (over 200 attempts and 47 successes in 2009). Religious extremism continues to spread, with hard-line Islamists banning World Food Program operations. 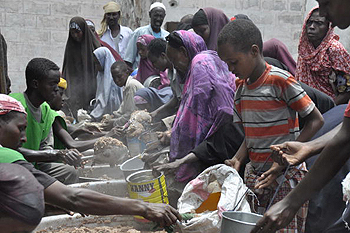 And 3.5 million Somalis remain on the verge of starvation. Dr. Oduesp Eman teaches political Islam in Turkey.